Pro Tips: Is Solar Right for You? If you're thinking about installing a solar energy system, you first want to be sure it makes sense for your home. Let us lead you through some of the variables you'll need to consider. Heating and cooling accounts for more than half of the energy use in a typical U.S. home—about 54 percent of your utility bill—making it the largest energy expense for most homes, according to the U.S. Department of Energy (DOE). Is it any wonder why most homeowners cringe when they open up their heating and cooling bills, particularly in years with bitterly cold winters and sweltering hot summers? But what if you could minimize the pain by substantially reducing—or in some instances even eliminating—your home’s energy costs? Solar may be the solution. Demand for solar energy in the United States is at an all-time high, according to DOE statistics. In the first quarter of 2012, developers installed 85 percent more solar panels than they did during the same period the year before. And, with new innovations, advanced technology, and decreasing product and installation costs, solar is becoming more attractive to homeowners in search of a smart, cost-saving, and environmentally friendly solution. We reached out to Kevin Lyons, product manager and energy efficiency expert at Lennox, to learn what considerations homeowners should take into account when deciding whether solar is right for them. Virtually all areas of the continental United States receive enough sunshine to justify adding solar power to a home’s heating and cooling system, but supplemental heat will be needed in regions where there is high heating demand and less winter sunlight—the northeast, for example. 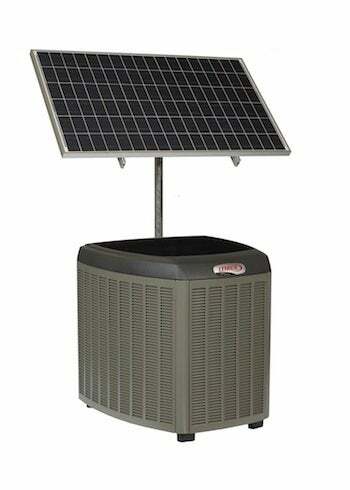 Photo: Complete Lennox SunSource installation with outdoor condenser unit. Home solar systems are typically used in conjunction with a heat pump to generate heating and cooling or to supplement air conditioning systems, according to Lyons. “Solar energy generated by the Lennox SunSource Home Energy System, for example, is first used to power the heat pump or air conditioner. When the heating and cooling system is not in use, the solar energy can operate other appliances and electronics,” Lyons says. Any excess energy that’s not needed will be sent back to the utility company, possibly entitling the homeowner to a credit. Does it matter what type of heating and cooling system I currently have? 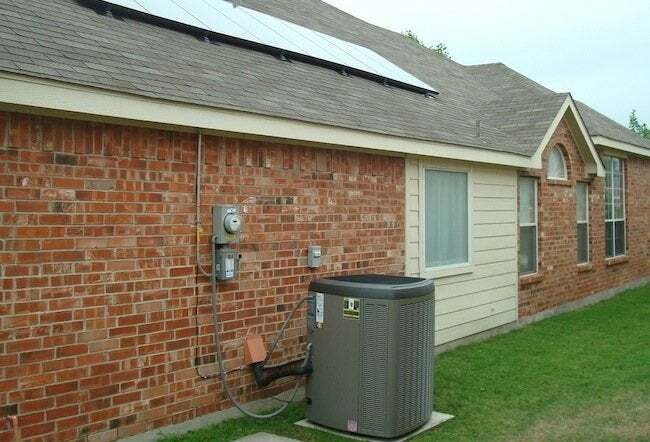 Solar energy can be used to power both hydronic and forced-air heating systems. “Active” solar systems convert solar energy to either heated air or liquid and use that energy directly to heat an interior space or store the energy for later use. Typically, liquid systems are used when storage is included; they are suitable for use with radiant heating systems, boilers with hot water radiators, and heat pumps and coolers. What are the upfront costs to installing solar? 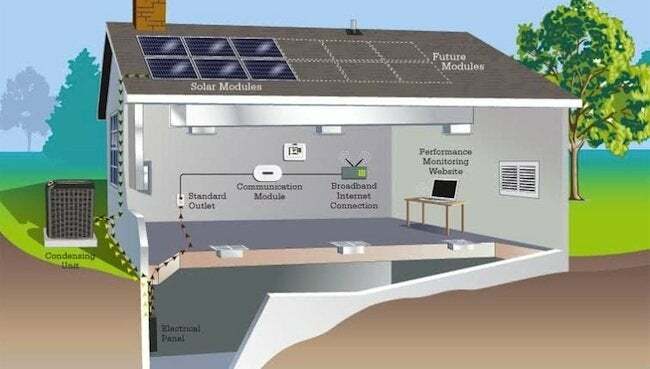 Although each solar installation is unique, small residential systems are available from major home improvement chains and are priced from $3,000 to $6,000 for backup power systems; industry estimates for the cost of a whole-home solar array run from $15,000 to $30,000 for the average household. “There are many variables that impact both the upfront cost and the payback period for installing solar,” Lyons explains. “These include the number of solar modules purchased and the type of HVAC system purchased as well as the types of solar incentives from states, cities, and utilities, which vary greatly across the United States.” Lyons points out that the Lennox SunSource system can be wired directly into a home’s HVAC system, making the system “solar ready” even if the homeowner decides to delay installing solar modules. What is the payback period for installing solar? Geographic location, local energy costs, and government incentives all impact the payback period for a home solar installation. “Depending on the local cost of electricity, the various incentives can lower the payback period to as few as five years,” Lyons states. “A federal 30 percent tax credit applies to all U.S. residential solar installations and applies to the entire installed cost.” Lennox offers this handy calculator to help homeowners estimate the energy savings they can achieve with solar power. Are there additional benefits to installing solar? Investing in solar energy may not only reduce your energy costs but also improve the value of your home. Surveys conducted by the U.S. Department of Housing and Urban Development have shown that home values rise an average of $20 for every $1 reduction in annual utility bills.